Applications module Edit and View pages Properties "Parameter"
Every parameter, fallback value and semantic value that have already been defined are shown on the left-hand side. If a parameter has fallback or semantic values, these are shown indented beneath the parameter. When creating a fallback or semantic value, select the respective parameter that it should be created for. The details of the parameter, fallback or semantic value, which has been selected on the left, are shown on the right side of the dialog. 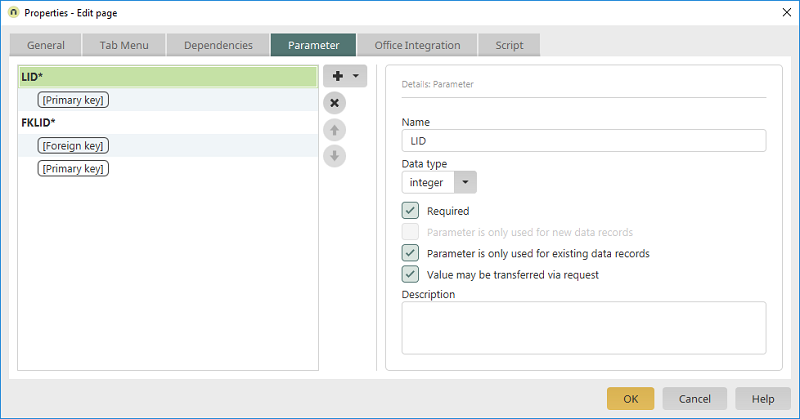 Opens a submenu where you can select whether a parameter, fallback value or semantic value should be created. Deletes the selected parameter, fallback value or semantic value from the list. Adjusts the order of the parameters, fallback values or semantic values. If you open this dialog from an edit or view page, you define here which information the edit or view page requires to be able to display the data fully. Any number of fallback values and semantic values can be specified for pages. Click here to read our general information about this topic. Provide the parameter with a name here. This needs to be unique within a page. Select the desired data type. With this setting, the page will not be displayed if the parameter is not found during loading. Here, you can define whether the parameter is demanded only for new, only for existing data records or always. Allows the value to be provided in the request. The parameter can be provided with a description here. From "callers", such as a button, the parameters are created here that the target pages demand. Any number of fallback values can be created. Semantic values can only be created for application pages. Click here for our general information on this topic. Enter the parameter name here. Parameter names need to be unique for each call - a button in this example. Enter the name that the parameter should be available under in the request. Any number of fallback values can be created or defined for each parameter. Click here for more information about the settings for fallback values. Any number of semantic values can be defined here for edit and view pages as well as a portlet container. Enter the name of the semantic value.